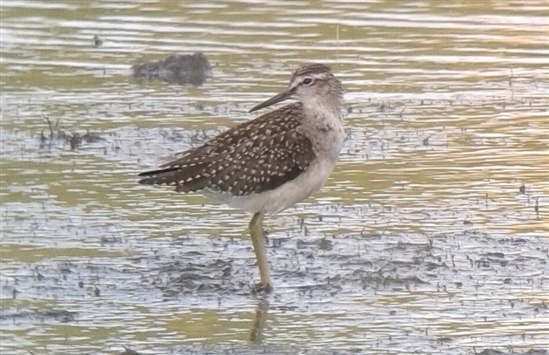 The most sought after bird over the past month was undoubtedly the wood sandpiper which stayed with us for 15 days from 8/8 to 23/8 and generally showed very well for visitors. Other main highlights were further visits from a great white egret on 14/8 and 16/8, and a female marsh harrier which was seen briefly over the reserve on 6/8 and 7/8. Other wader highlights have included green sandpipers on numerous days with up to two present, little ringed plover from 25/8 to 27/8, sanderling on 11/8, and regular whimbrel. Black-tailed godwits peaked at 14 on 1/9, and dunlin at 28 on 15/8, while small numbers of ringed plover have often been present and numbers of snipe have continued to increase. Small passerine migration has brought us a spotted flycatcher on 26/8, four crossbills over on 1/9, regular sightings of juvenile redstarts, and small numbers of wheatear, goldcrest and white wagtail. Other highlights have included a Mediterranean gull on 9/8, and sandwich terns on several days with a peak of four on 27/8. Meanwhile water rail sightings have been regular, a kingfisher has put in several appearances, and wildfowl species have started to become more varied as we head into the autumn, with small numbers of pochard and shoveler often present along with the first wigeon of the season which first appeared on 27/8. An otter was seen on 26/8, while stoats and foxes have been seen regularly. Meanwhile dragonfly activity has been very noticeable over the past month, with common darter, common hawker and emperor dragonflies often seen laying their eggs on the ponds and lagoons. 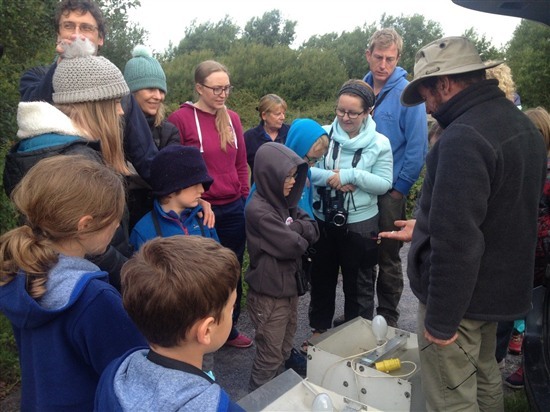 With the summer holidays well underway, August was a busy time for events on the reserve. The second of two highly successful Big Wild Sleep Out events took place on 4/8 to 5/8 where families had the exclusive opportunity to camp out on the reserve and experience a range of activities including moth trapping, bat detecting, astronomy and various wildlife challenges. Young children had the chance to get up close and learn all about bees and butterflies during our Buzzy Bees, Beautiful Butterflies event on 1/8. Our Red squirrel Weekend on 11/8 - 12/8 gave visitors the opportunity to learn about red squirrel conservation in North Wales, with visiting staff from the Red Squirrels Trust Wales. Our Wildlife Lego event on 21/8 also proved very popular where children were helped to create wildlife creatures and animated videos while exploring the habitats of the reserve. Two FunPlay Friday events were also held during the month on 10/8 and 31/8, also proving as popular as ever, with a variety of activities and play equipment available for children. Regular Wildlife Drop in days were held each Thursday where children could have a go at pond dipping, and Quiz Trails including Fairies and Dragons and Bryn the blackbird kept children engaged and entertained while exploring the reserve trails throughout the summer holiday period.